The heat transfer printing woodgrain technology is performed by electrostatic powder coating on a metal material and then sublimating and infiltrating the composite ink which on the grain paper or film under the condition of high temperature and high pressure through the woodgrain transfer equipment on the coated surface. Into the powder coating, the transformation process that makes the surface of the wood grain decoration effect. With the progress and development of wood-grain products, the application field is also constantly expanding. The main applications of aluminum profile products are: aluminum alloy architectural profiles and doors and curtain wall profiles, indoor sliding doors and interior decoration, shutters, and aluminum furniture and so on. 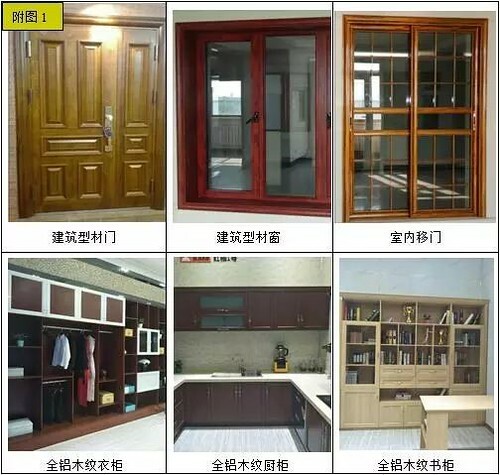 Aluminum household is a new industry that is strongly promoted by the government and will become a larger new field for wood grain applications. Wood grain aluminum profile will be widely used. The main types of wood grain are 3D wood grain, 4D etched wood grain, 4D sprayed wood grain, 4D chip wood grain, PU powder wood grain, polyester powder wood grain, crystal swimming paint wood grain, electrophoretic paint wood grain, etc. 6) Aluminum alloy structure: high hardness, long service life, outstanding value, reasonable structure, easy installation, beautiful and durable. Therefore, today people pay more attention to the trend of energy conservation and environmental protection. The woodgrain transfer aluminum profile will lead the trend of the decoration market with its unique superior characteristics.